The House with a Clock in Its Walls is a film that feels like an eighties style Spielberg film combined with Goosebumps and Harry Potter. It is a horror movie for kids that adults should also enjoy. I found the movie to be very charming and engaging. Jack Black and Cate Blanchett are great together as our lead characters Uncle Jonathan and Mrs. Zimmerman. Then, young actor Own Vaccario as Louis holds his own with these top of the line actors. Again, as it is in most of these kinds of films, if the young actor does not carry himself well, the entire movie falters. Louis’s parents died and he has come to stay with his Uncle Jonathan, who lives in a mysterious house that some people believe is haunted. It is not too long after his arrival at the house that Louis realizes that there is something magical going on inside the doors. Meanwhile, Uncle Jonathan is looking for a hidden clock somewhere in the house, that he hears ticking in the middle of the night and he seems to be desperate to discover where the clock is found. There are some great scenes in this movie and I really found it charming. There were even moments in the film where I was tearing up because of what was happening. I loved the platonic pairing of Jack Black and Cate Blanchett. They are wonderfully witty together with the back and forth banter between them. Another favorite of mine is Kyle MacLachlan, who is the villain of the piece, Isaac Izard. MacLachlan is always good in whatever role he is in and this is no exception. Some of the humor was too juvenile for me, but there were not too many of them to bring the film down. Most of the film’s humor was funny and witty. There were a couple too many poop jokes, though they are more creative than usual. There are some scary moments that might be considered too much for a really younger child. This would be a great family film for mid aged children. It can be a great way to introduce children to the genre of humor. I was shocked when I saw that this movie was directed by Eli Roth, who was more known for his blood and gore films than anything else. I would never have made the connection to Eli Roth had I not seen his name in the credits. Another strong part of the film was the school section for Louis as he had to find his way through the political-like environment of the students. I liked how one storyline piece did not go in the direction you thought it would go when it started off. 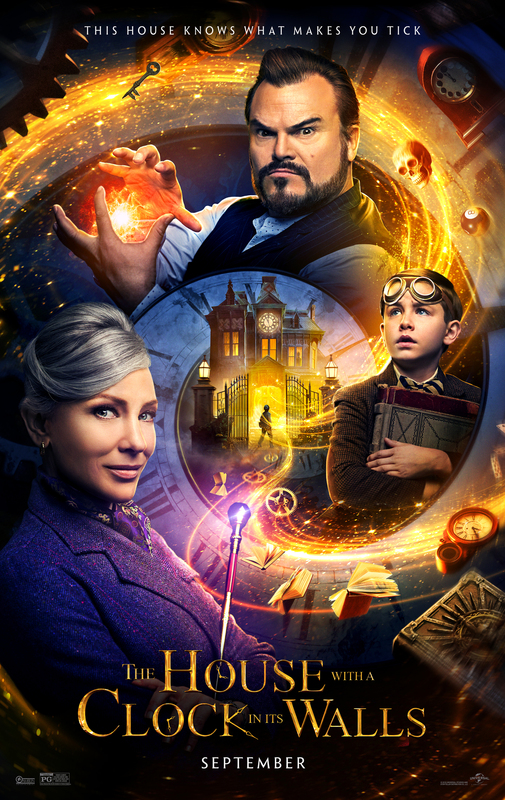 The House with a Clock in Its Walls is a very solid and enjoyable movie with some very great performances from some wonderfully talented actors. The CGI is fine and the story develops well. Some of the humor misses, but more hits than not. This feels like a future member of the 31 Days of Halloween on Freeform. This entry was posted in 2018- Doc's Movie Reviews. Bookmark the permalink.